For love not money is the ethos of this place and their name reflects that using the first two letters of each word in the saying. It’s Sydney’s first “profit for purpose” restaurant, where after operating costs, all profits go to charity. 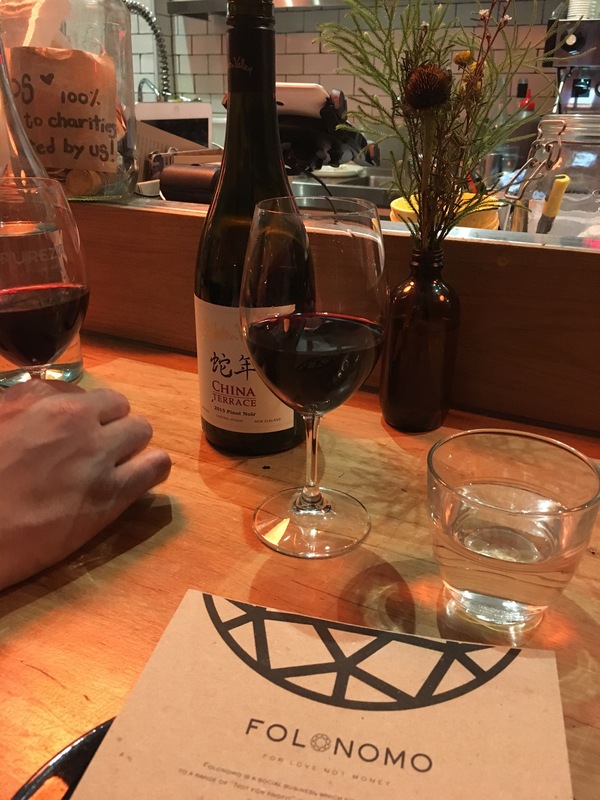 The food is sustainable and ethically sourced, but it’s beautiful, tasty, fragrant and inspires long comfortable dinner talking & laughing with your love or a bunch of friends. 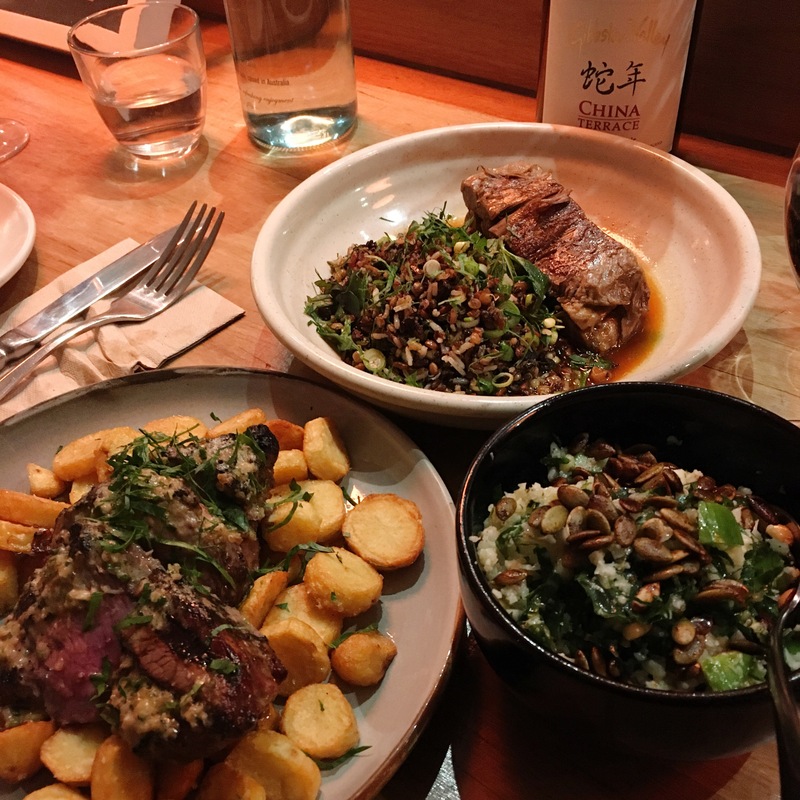 Simple dishes (rump steak with kipfler potatoes & eel butter) yet complex with texture (braise lamb shoulder with ‘dirty rice’ that consists of three different types of rice with crunchy toasted seeds and duck mince). Their kitchen is small but lively and sitting at the counter you get to see the dedication to quality and the enjoyment that is had by the chefs and cooks to produced these dishes. It’s fun efficiency, especially when the night starts to wind down and “staffies” beers are cracked as a reward to a job well done. All plates are for sharing and we had one of the two sides; the cauliflower rice with silverbeet lemon & mint and it was to.die! The soft yet still firm cauli mixed with pops of mint, wholesomeness of the silverbeet and crunch of toasted seeds was a true party in my mouth! It was a fresh side to lighten the richness of the steak & fall-apart lamb dishes. 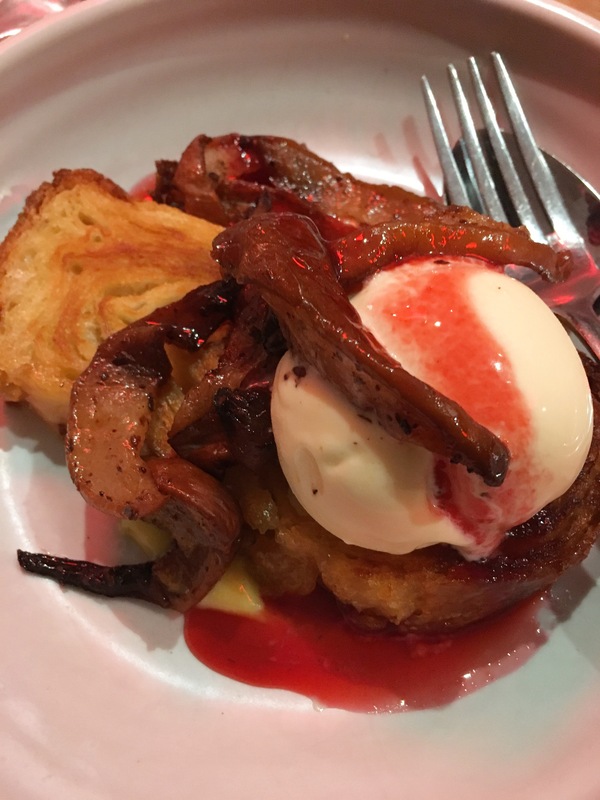 Again, dessert was shared; this heavenly French pastry bread called ‘kouigin amann’ buttery and toasty and served with baked pears, firm and caramel-y, lemon curd and in-house vanilla icecream. Oh.My.God. Seriously. It’s BYO wine/champers at the moment while they wait on their liquor license. 5 dishes, wonderful staff, good food, good atmosphere, $125. Leave a hefty tip because it all goes to charity!